Do not adjust your monitor: this lime is weirdly red on the inside. In fact, the fruit is genetically engineered to create proteins that provide the color, as well as potentially making the lime more health-giving. Developed by researchers from the University of Florida, the Mexican lime you’re looking at has been modified so that its contains a protein that induces a process known as anthocyanin biosynthesis. It’s the same process that causes grapes to develop red skins and blood oranges to develop their deep-red flesh. And those same anthocyanins have been linked to some potential positive health impacts in the past. 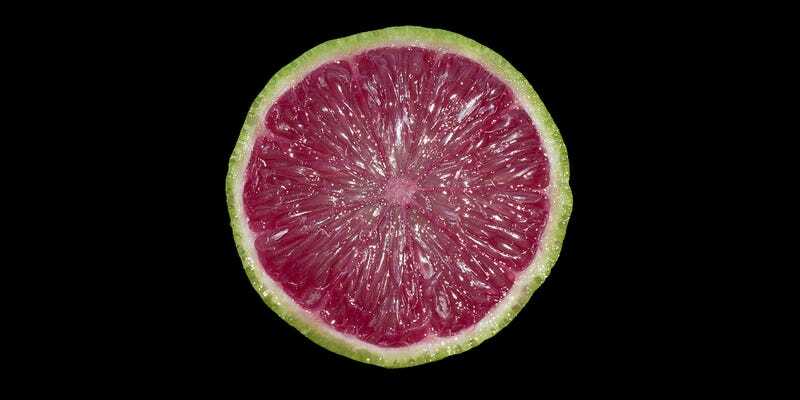 The new lime borrows genes from the red grape “Ruby Seedless” and the Blood Orange “Moro.” It’s not the first red-fleshed lime, but it is unusual in the fact that it’s vivi green on the outside and yet red on the inside. The researchers claim it represents the first step to introducing blood oranges—which usually grow in cool climates—to Florida. But for now, they also suggest that the limes could “turn your next margarita on its head by making it a lovely lavender instead of passé pale green.” We’ll drink to that.